The architecture at Rock Lodge definitely stands out from the crowd – many people love the Mexican styled architecture! 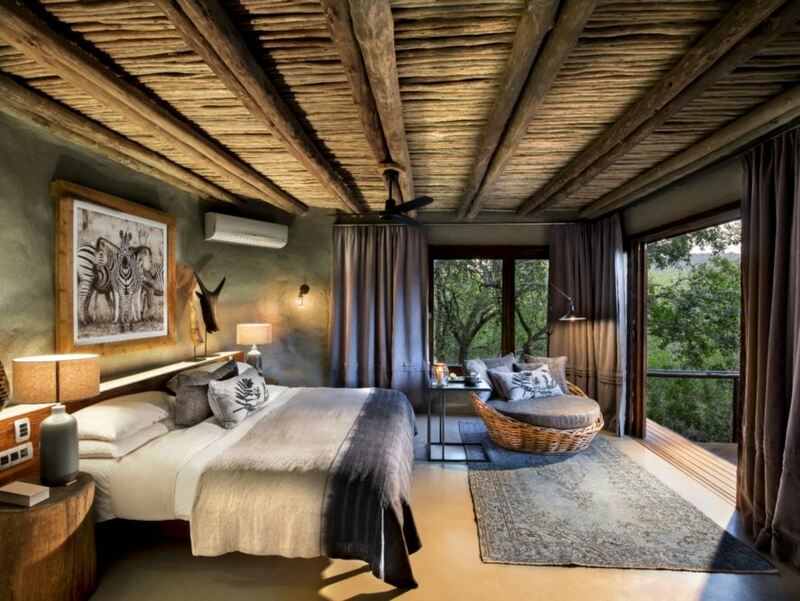 The unique feeling of living in a wonderfully luxurious cave set on a cliff-face – if you’re looking for a completely different game lodge experience then look no further! At this lodge you can enjoy the game viewing as well as viewing marine life and a visit to some pristine beaches – it’s just a short trip to the subtropical Maputoland coastline! Your private plunge pool set on your viewing deck warms to the sun during the day - the perfect place to relax after your morning game drive! The architecture at Rock Lodge definitely stands out from the crowd – many people aren’t turned on by the Mexican styled architecture! almost as though you’re part of an elite tribe of cave dwellers – only we’ve never before heard of Flintstone-style lodgings that also boast private plunge pools and outdoor showers! 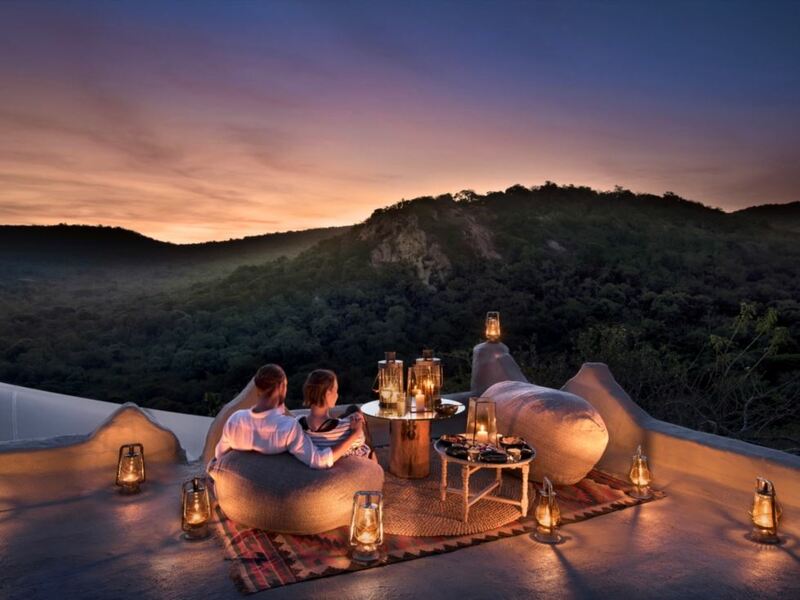 The Rock Lodge at &Beyond Phinda Private Game Reserve is nestled below the Lebombo Mountains of northern KwaZulu-Natal. Phinda is a Zulu word meaning "the return" and this refers to the massive game re-introduction programme that has seen this previously overgrazed and degraded farmland return almost miraculously into pristine bush over the last couple of decades. One of the main attractions of Phinda is that the reserve is home to seven distinct habitats and is located between the warm waters of the Indian Ocean and the lush World Heritage Greater Saint Lucia Wetland Park – and spans over 17 000 hectares of land! 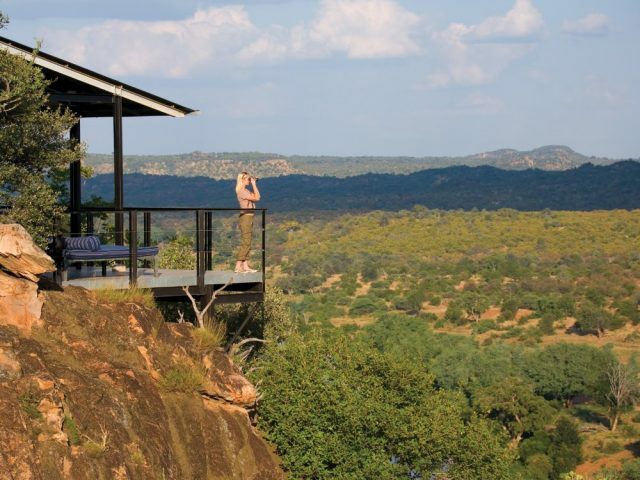 Rock Lodge is dramatically set into a cliff-face overlooking the spectacular Leopard Rock – its six indigenous air conditioned suites are seemingly suspended and perched high on the rocky cliffside over the deep valley below! Snuggled high above the surrounding panorama, your closest neighbour is likely to be an inquisitive baboon paying you a friendly visit on the dining deck. The lodge has a completely unique (and somewhat bizarre to be honest) architectural theme in that when you first set eyes on the ochre walls clinging to the cliff face you’ll need a second look to realise you haven’t arrived at a Mexican hacienda! The rugged and earthy adobe-style (ochre coloured mud packed walls) building is combined with interior décor touches that range from Mexican/Spanish to West African. 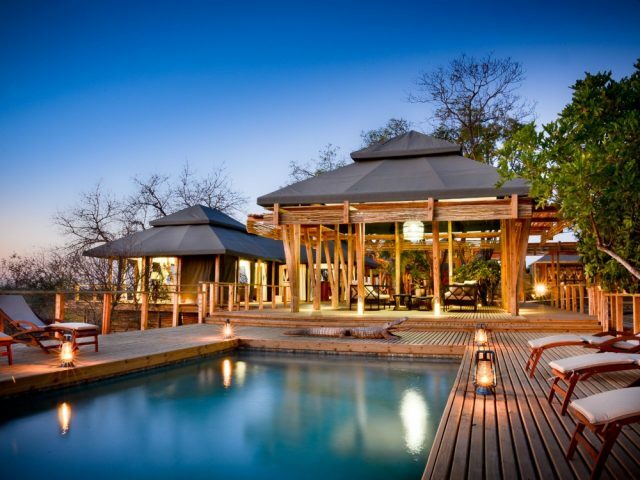 Frankly it is one of those lodges that is likely to evoke a pretty strong either “love it or hate it” reaction to its unique architecture – we would personally prefer something with a more authentic African feel, but it may just be what floats your particular boat! Freshening up after your morning game drive becomes an experience all in itself - with deep bathtubs encased in wide windows that open up onto a spectacular view of the valley! While you soak up the warm water and bubbles you can gaze over the bush setting – perhaps enjoying the view of nyalas grazing on your doorstep! Three suites offer outdoor showers so deeply sheltered in the leafy growth that you’ll feel as though you’re bathing in your own private waterfall! The lodge’s comfortable sitting areas are the perfect vantage point for viewing the abundant birdlife in the surrounding trees, and the wildlife roaming the bushveld below. What better than to sit back in a leather chair with binoculars and enjoy the view of the watering hole as it invites wildlife in the valley to slake their thirst! As your sense of adventure awakens, one quick leap through an open wooden shutter takes you to a rustic ladder leading to the roof - soon to be stopped in your tracks as you gaze over the unrivalled panorama before you. When night draws in, you can retreat to the warm refuge of an intimate gathering around a roaring fire in the public area - this can be a true delight on those chilly winter evenings! Meals are savoured in the cosy dining room under hand-wrought chandeliers among friends, both old and new. If you'd prefer a candle-light dinner for two this can be arranged in the haven of your own suite – between the background sounds of game and the delicious food, you can't help but find your evening to be utterly romantic! Service is superb with your every wish taken care of - the most difficult decision you may be faced with all day is deciding whether you would like white wine or red with your meal! 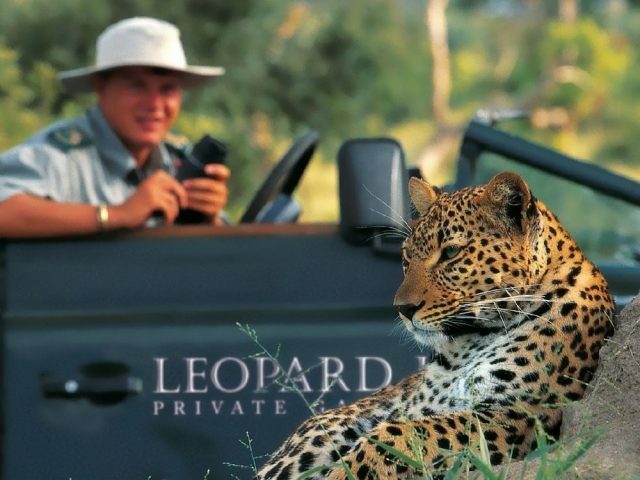 This private Big Five reserve is famous for its abundance of game - the lodge offers exciting game drives in open 4x4’s with experienced trackers and rangers, as well as guided nature walks where you can really get up close and personal with the bush. You can also enjoy some excellent bird watching from motorboat cruises or paddling your own canoe along the Mzinene River or why not take an excursion to the nearby subtropical Maputoland coastline and take part in other water-based activities such as snorkelling, canoeing and scuba diving!